Rich Schneider, PhD, Associate Professor in the Department of Orthopaedic Surgery, School of Medicine, makes “quck” for a living. “That’s always a good conversation starter,” Schneider said. 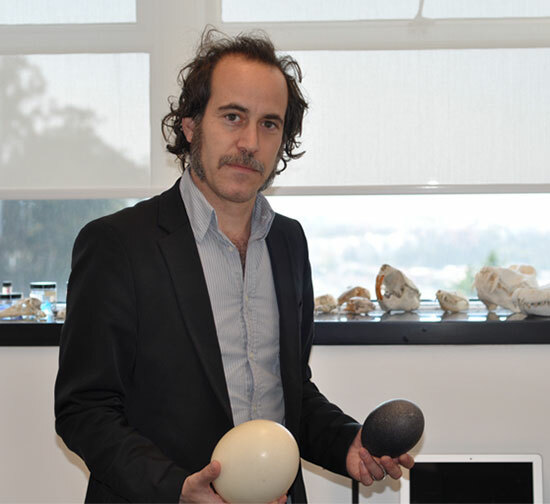 The window sill in Schneider’s office has a variety of animal skulls, indicative of his research in craniofacial development-- which in turn led him to quck. After Schneider received his PhD in Zoology in 1998 from Duke University, he completed a postdoctoral fellowship at UCSF researching how the face forms. He developed a one-of-a-kind transplant system combining quail and duck embryos. Twenty years later, Schneider is still at UCSF making quck and trying to create molecular-based treatments for those with defects, diseases, or trauma in the musculoskeletal system. Once while walking around the City, Schneider saw white Pekin duck hanging in a restaurant window. “I had a total ‘Eureka!’ moment when I realized that there must be a commercial supplier of duck for San Francisco’s Chinatown, and thus knew I could readily get embryos for transplant experiments,” Schneider said. Schneider began to exchange stem cells that would eventually form the beaks of quail with those that would produce the bills of duck. “When I talk about the quck to students, donors, or the general public I have a highly accessible vehicle for explaining my job and what I do in a way that advocates for science, especially the importance of basic research and the value of approaching questions unconventionally as a pathway to discovery,” Schneider said. Advocating for science and education, and also transforming scientific communication have been an essential part of Schneider’s career. Beginning in 2004, he has played a role on the Committee on Library and Scholarly Communication at both the UCSF level (COLASC) and the systemwide UC level (UCOLASC). “When I got to UCSF and was trying to find a place to offer service, I thought of the library committee, because of my love for research and scholarship,” Schneider said. In 2005, Schneider began serving on UCOLASC. He became Vice Chair in 2008 and served as the Chair for two years after that. He continues to serve on COLASC, where he was Chair from 2011 to 2013, and he is Chair again now. His service to these committees has resulted in his relentless advocacy for transforming scholarly communication and for the open access (OA) movement. This publication model arose in response to unnecessary barriers to accessing research results, the high prices charged by publishers for subscriptions, and the restrictions placed by publishers on the re-use of scholarly works. In advocating for the library and to help control the spiraling costs of journal subscriptions, Schneider lead a proposed boycott against the Nature Publishing Group. He also played an essential role in drafting and implementing the UCSF OA Policy, the UC Systemwide OA Policy, and the Presidential OA Policy. Now he has turned his attention to an initiative called OA2020. These OA policies allow faculty members to retain ownership of their scholarly work, and make their work freely available to other researchers and the public at large. 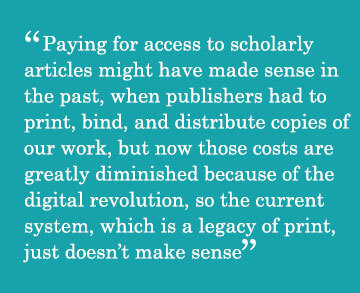 “Paying for access to scholarly articles might have made sense in the past, when publishers had to print, bind, and distribute copies of our work, but now those costs are greatly diminished because of the digital revolution, so the current system, which is a legacy of print, just doesn’t make sense,” Schneider said. High costs for subscriptions force libraries to make very difficult choices in support of their faculty, especially when budgets are as tight as they have been for the past decade. Many institutions cannot afford the exorbitant price increases that commercial publishers charge year after year. Schneider’s vision for open access has taken him over a decade to implement for all UC campuses. He realized early on that it would not be easy, so he began with UCSF. He made presentations at numerous Academic Senate and School-related committee meetings, ultimately resulting in 2012 with the unanimous passing of the Open Access Policy for UCSF Faculty. This led to the UC Systemwide Open Access Policy in 2013. In 2015, Schneider served on a Presidential Task Force and was instrumental in helping to pass the “UC Presidential Open Access Policy,” which extended open access to all UC employees and students. “During my efforts to bring open access to UCSF and to other UC campuses, I became extremely proud of how my colleagues supported me and rallied to the cause. Working with faculty, library administration, and campus leadership across the UC System allowed us to serve as an example for other institutions to follow” Schneider said. Schneider’s next goals at UCSF are to continue lobbying for the OA Fund and the OA2020 Initiative. The OA Fund covers the submission costs for OA articles. For the past three years, the Academic Senate has provided financial support, but the demand routinely outweighs the funding. So this year Schneider successfully obtained $100,000 to support the fund. Open Access 2020 (OA2020) is an international initiative which aims to turn all subscription journals in to open access journals. The OA2020 initiative has three aims: first, to transform a majority of today’s scholarly journals from subscription to OA publishing in accordance with community-specific publication preferences; second, to pursue this transformation process by converting resources currently spent on journal subscriptions into funds to support sustainable OA business models; and third to invite all parties involved in scholarly publishing especially universities, research institutions, scholarly societies, authors, funders, libraries, and publishers to collaborate on a swift, orderly, and efficient transition to OA for the benefit of scholarship and society at large. Currently, there are 71 scholarly organizations throughout the world who have signed an “Expression of Interest” for the OA2020 Initiative. Schneider is working hard here at UCSF and with colleagues at other UC campuses to help make OA2020 a reality. After almost two decades at UCSF, Schneider continues to have an impact in academics, research, and service, particularly on the library committee. When he is not busy at the university, he spends time with his family and friends cooking and listening to his collection of vinyl. As a life-long drummer (since age seven), Schneider had taken a year off from grad school to tour with a friend’s band. Other friends are professional musicians and when they come through San Francisco to perform, they visit him in the lab. “Everybody loves the quck and wants to see where they are made,” Schneider said. Schneider also spends time sharpening his drumming skills while playing music with his sons.